Donations to OTC's general operating fund are much appreciated. They help support Mike's ongoing work as the Executive Director of the ORGANIZE! Training Center. To make a donation, please click on the donation button above. 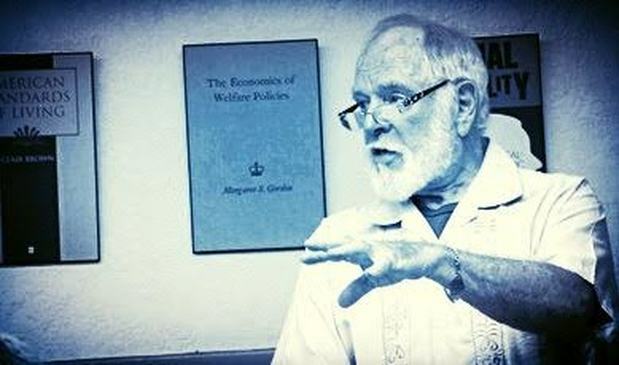 Herb Mills, long-time leader in Local 10 of the International Longshore & Warehouse Union (ILWU), and PhD in political science from the University of California (Irvine) died of natural causes at Kaiser Hospital San Leandro on August 7, 2018. He was 87. Mills was born in October, 1930, and grew up in Dearborn, Michigan. He was the descendant of early American settlers. Mills worked in the Ford River Rouge plant in Michigan where he learned about labor unions and decided to go to college. He was a Phi Beta Kappa graduate from the University of Michigan and earned a PhD in political science at the University of California, Irvine. While at Berkeley, Mills became active in SLATE, the student movement organization there, and served as picket captain for the Student ACLU picket line at the 1960 demonstrations against the House Un-American Activities Committee (HUAC) at San Francisco’s City Hall. He traveled the country in 1960 and 1961 as a spokesman for the protest. In 1963, Mills dropped out of graduate school to become a San Francisco Bay Area Longshoreman. He soon became active in ILWU, moving from shop steward to chairman of the stewards’ council to business agent and, finally, to secretary-treasurer of Local 10. During his time as a union officer, he was the key leader in ILWU’s refusal to ship military cargo to post-coup d’etat Chile, winning support from 175 members of the House of Representatives and a final decision by the Carter Administration to cancel the shipment. A similar effort stopped military cargo from going to the El Salvador military junta. When the military government of South Korea announced plans to execute democracy movement leader Kim Dae Jung, Mills took the lead in getting ILWU to threaten a Pacific Basin refusal by longshoremen to unload South Korean ships. It stopped the execution. Seventeen years later, when Kim was elected South Korea’s president, Mills and ILWU President Bryan McWilliams were invited to his inauguration as honored guests. He led efforts to tie the assassination of two young Filipino officials of Seattle ILWU Local 37 to the Ferdinand Marcos’ regime. As a result of this work, their heirs filed a wrongful death suit against Marcos’ widow Imelda Marcos and received a $2 million judgment. Mills took injury-related retirement in 1990. Of his work and union he said, “Thank God for the union.” He wrote numerous articles and papers about longshore work and the ILWU, completed an oral history, and wrote an unpublished novel titled “Presente”. Many of his monographs and articles can be found at: http://www.ilwu10hmills.com. In January, 2018 Local 10 presented him with a lifetime achievement award. He had a great love of nature, and regularly took his children fishing, hiking and camping. Quotations from him and personal items are featured in the Transportation exhibit at the Smithsonian National Museum of American History and in the entrance hall to the San Francisco Exploratorium. Mills is survived by his three children, Sarah, who lives in Berkeley, CA, Lydia and her husband Jorge, who live in Santiago, Chile, and Jon and his wife Debra, who live in Monterey, CA, and five grandchildren, Jazmín, Violeta, Víctor, Kai and Michael; by Rebecca Mills, mother of Sarah and Lydia, and; by Deanne Burke, mother of Jon. Contributions to honor his memory and make his writing more widely accessible may be made to the Herb Mills Legacy Project by clicking on the donation button above; or by check to HMLP, 442 Vicksburg Street; San Francisco, CA 94114; or to the World Wildlife Fund at https://www.worldwildlife.org. You can download many of Herb's articles from his website here. Herb Mills was my best friend. He was a mentor, big brother and friend. He, Bob Moses and Saul Alinsky are the major influences on my public life. We met under inauspicious circumstances! I was at Columbia University when Herb started dating my good friend, Patricia Lynden. I knew Herb’s reputation as a ladies man, and wrote Pat accordingly. She was angry with Herb when my letter arrived, so she left it out where he would see and probably read it. He did. She was later very apologetic. When I headed to Berkeley for 1958 Christmas break, I had great trepidations about meeting Herb. “Let’s go for a beer,” he said. Off we went for a two or three hour conversation. Not one reference was made to my letter. Our friendship got off to a great start. From 1961 until he got married we were housemates. Herb was brilliant. He read deeply in antiquity, the Bible, Athenian democracy, the Roman Empire, the American novel, political and sociological theory, and more. At Cal, he was Teaching Assistant for Sheldon Wolin, one of this country’s most respected political theorists. Herb was THE master strategist of the early student movement at UC. In 1959 or 1960, he got active in SLATE, the campus political party, and was central to steering it through the thicket of sectarian left politics, and maintaining its ability to win broad support on campus. He was picket captain for the Student ACLU’s demonstration against the House Un-American Activities Committee, and later traveled the country speaking against a Young Americans for Freedom film that attacked the demonstrators as communists and communist dupes. I’d like to now ask you to share your Herb stories with one another. If you’re a longshoreman or ILWU friend of Herb’s would you please raise your hand, and keep it raised. Now I’d like the rest of you to distribute yourselves so that there are two-or-three of you with a person who has his or her hand up. And I hope you won’t know the other two-or-three people too well either. Now I’d like you to each share a Herb story with the others in your group. Please take about two minutes each. I’ll give you a heads-up when your time is about up. In 10 minutes, we’re going to come back together. In 1963, I got a call from ILWU’s Dave Jenkins: the union was opening its B-man list for 200 men. I was too involved with the Student Nonviolent Coordinating Committee to apply, but I passed the information on to Herb. He became a longshoreman. Herb rose in leadership from steward to stewards’ council chairman, to business agent and, finally, to Secretary-Treasurer. Local 10’s Constitution limits officers to two consecutive one-year terms, so Herb was regularly back in the holds of ships. Herb led the union’s refusal to load military cargo to dictatorships in Chile and El Salvador. The El Salvador action took place during the Ronald Reagan-era. Herb lined up major religious leaders, and 175 members of Congress to support the action, recognizing that without it, Reagan would have loved to crack down on the union. He planted a rumor where the South Korean CIA was sure to hear it, saying if Kim Dae Jung was executed there would be a Pacific Basin longshoremen’s refusal to handle South Korean cargo. It was a bluff, but the Korean CIA didn’t know that. Seventeen years later, Kim was inaugurated as the democratically elected president of South Korea. Herb and ILWU International President Brian McWilliams were there as distinguished guests. Herb was a realist and a man of deep principle. It is easy for people who don’t work along the shore to call upon dockworkers to refuse to load or unload cargo. It is far more difficult for them to do it. The ILWU-Pacific Maritime Association contract forbids such action. A heavy fine can be imposed. Herb was equally active on bread-and-butter issues, in internal struggles to maintain the democratic character of the union, and in the fight to prevent ILWU’s disappearance in a merger with the East Coast longshore union or the Teamsters. On more than one occasion, he crossed swords with Harry Bridges, the union’s legendary president. Herb loved to tell union and work stories. Indeed, he loved to repeat them. Hearing one story for more than the second time, Becky noted a discrepancy and called Herb on it. “It ain’t the f…’in’ accuracy that counts; what’s important is the lesson the story teaches,” he said. That was actually an old Wobbly line; I suspect Herb learned it there. Herb’s capacity for resolve was unmatched by anyone I have ever known. When he had heart bypass surgery, his doctors told him to quit smoking. He gave up his almost-three packs a day habit cold turkey. One day he was a smoker, the next day he wasn’t. He did the same with drinking. He also was resolutely against exercise. Despite my imploring him to walk, he dismissed it as a middle class affectation. “I ain’t doin’ no exercise just because it’s the thing to do” he told me. Herb was devoted to his children. When we’d visit, even before the longshore stories I heard about his kids latest accomplishments, or trips he’d taken with them, or fish they’d caught, or talents they’d acquired. I heard about coach Jon’s water polo team when it won matches, Lydia’s classes for music teachers, and Sarah’s organizing flight attendants into a union. His kids’ pain was his pain; their joy was his joy. Each new grandchild was the invention of grandfatherhood, with Herb the proud grandfather. Herb was a remarkable combination of self-confidence without a trace of arrogance. That self-confidence made it possible for him to go toe-to-toe with Harry Bridges or the Pacific Maritime Association, and to imagine beating Ronald Reagan. He won far more battles than he lost. He was not interested in rationalizing defeats as educational campaigns. Yet throughout the years of our friendship and listening to his many stories, I never once thought he was egotistical. Wordy, yes, and repetitive too. Truth be told, I’d heard some of those stories so many times, I could complete them from memory. But egotistical or arrogant, no. And a funny thing is, the stories never got boring. To the boss of wherever Herb now resides: be careful. You better honor the dignity and rights of everybody else there. If you don’t, you’re going to find you have a new adversary who is one f…in' tough guy to beat! Thank you for joining me in honoring Herb. Quote at the top of the page by R. Buckminster Fuller.